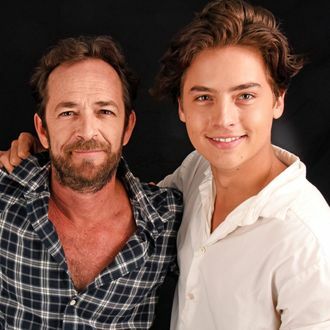 In the days following the death of actor Luke Perry, his 90210 and Riverdale co-stars posted a flurry of social media tributes in his honor — with just about all of them reminiscing about what a kind, immensely popular figure he was within the Hollywood community. (Remember, he made it cool to be kind.) Cole Sprouse, who acted alongside Perry over the past three seasons on Riverdale, expounded on the extent of Perry’s likability while swinging by Busy Tonight on Tuesday, saying he literally never met a single person who didn’t like him. Riverdale shut down production after Perry’s death earlier this month, and the show’s executive producers likened him to a “father figure” and “mentor” who was an “incredibly caring, consummate professional with a giant heart, and a true friend to all.” To honor his legacy, all future Riverdale episodes will be dedicated to Perry with a title card in the credits.